Cricket - Old Town v Luddendenfoot. Charlie Holt-Conway polishes the ball for Luddendenfoot. Illingworth SM put a one-run defeat at Clayton the previous week behind them with a comfortable eight-wicket win in an early-starting Division One game at Stones. It enabled them to stretch into a 14 point lead at the top and keeps them firmly on course to play Premier Division cricket two years after their return to the Spenser Wilson Halifax League. Put into bat in a 40 over contest, the home side struggled to 154-6 with James Robbins’ undefeated 39 the top score. Skipper Ben Robertshaw was the pick of the visiting bowlers with 4-40. Illingworth’s batsmen made short work of the target with Dan Murfet (62) and James Lawton (49) both undefeated in a stand of 104. Victory was completed in just the 16th over. Great Horton Park Chapel lost second place to Clayton when they were beaten by six wickets at Sowerby Bridge. Jake Dixon’s four victims included Chapel’s leading scorers Vinette Batley (46) and Matthew Jordan (38) as the visitors totalled 177. Second wicket pair Lewis Mattock (51) and James Taylor (46) put Bridge firmly on course and Tim Helliwell (32 no) helped complete the task. Blackley must have been fancying their chances when Dominic Walsh (89) and Adam Turner (62) helped the Lindley Road side total 321-6 off 40 overs at home to Clayton. However, it is invariable a good wicket at Blackley and Clayton knocked off the runs for six down with all their top seven scoring well, led by Sam Wilson (74) and Matthew Roe (59 no). It could hardly have got any tighter, Roe hitting a last ball six with the scores tied. 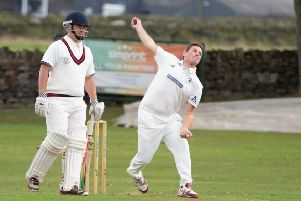 Experienced left-hander Steve Beck made a century as Bradshaw beat neighbours Queensbury by 104 runs at Bradshaw Lane. Beck was one of five players caught behind by wicket keeper James Broadbent, but only after he had made 119 as the home total climbed towards 282-8. Aaron Buckley, the middle section’s top wicket-taker in 2018, then took his tally to 33 with 6-42 as Queensbury were dismissed for 178 with middle order men Oliver Challis (56) and Josh Dougall (41) their best performers. Scores: *Blackley 321-6 (Walsh 89, Turner 62, T Baxter 41), Clayton 327-5 (Wilson 74, Roe 59*, Artist 45, Brown 45): pts: 4-10. *Bradshaw 282-8 (Beck 119, Collins 40), Queensbury 178 (Challis 56, Dougall 41, Buckley 6-42): pts 12-4. Great Horton PC 177 (Batley 46, Dixon 4-57), *Sowerby Bridge 183-4 (Mattock 51, Taylor 46): pts 3-12. *Stones 154-6 (Robertshaw 4-36), Illingworth St Mary’s 158-2): pts 2-10. Points (after 12 games): Illingworth St Mary’s 120, Clayton 106, Great Horton PC 105, Sowerby Bridge 102, Bradshaw 90, Blackley 64, Queensbury 46, Stones 38. Only four matches went ahead in Division Two, bottom side Cullingworth failing to raise a team to play Old Town seven days after a one-run win over Bradley and Colnebridge in a stormy contest. The two sides above Old Town, Mount and Luddenden Foot, had to work harder for 11 and 12 point returns respectively. Bradley and Colnebridge’s Irfan Rashid (6-68) dismissed Mount’s top four batsmen and then came back for more but a string of double-figure contributions helped the Staincliffe side to 235 all out. Raja Khan (73) and Shahraiz Khan (52), two of seven Khans in the visiting line-up, led the Bradley response. However, Imran Ravat took four catches and a couple of wickets after coming on as seventh choice bowler to tip the scales Mount’s way. Outlane’s first three batsman Adam Davies (75), Lee Mellor (70) and Zeeshan Rahman (55) put their side on top at Luddenden Foot. The visitors were 207-1 at one stage with the first five Foot bowlers going for at least a run a ball. Owen Bairstow (5-53) and veteran batsman Richard Pinder (4-39) not only applied the brakes but limited Outlane to 283. After that it became the Charlie Holt-Conway show. The Foot No 3 destroyed the Outlane bowling with 151 off only 62 balls, including 12 maximums. His hundred came off 32 balls, with his second 50 off 11 as Foot won by five wickets in good time. Leymoor’s Mark Coulson had a triple wicket maiden en route to figures of 7-86 at home to Upper Hopton but still finished on the losing side in an exciting contest. Hopton were 114-8 but Coulson found Jack Stephenson (62) more difficult to get rid off as the visitors’ total climbed to 197-9. Richard Walkden (61) led the Leymoor reply and Daniel Murgatroyd (33) took the home side close but Matt Broadbent (4-40) bowled him to give Hopton a seven run win. There was a welcome second win of the season for next-to-bottom Greetland at home to Low Moor. Jamie Moody, batting at No 10, made a valuable 31 not out to lift Greetland’s total to 174-8 and he kept up the good work with the ball, taking 7-55 as Moor were dismissed for 129. Scores: *Leymoor 190 (Walkden 61, Broadbent 4-40), Upper Hopton 197-9 (Stephenson 62, Coulson 7-86): pts 5-12. *Greetland 174-8 (Reynolds 43, Zaman 4-49), Low Moor HT 129 (Moody 7-55): pts 12-3. Outlane 283 (Davies 75, Mellor 70, Rahman 55, Bairstow 5-43, Pinder 4-39), *Luddenden Foot 284-5 (Holt-Conway 151, Whittingham 40): pts 4-12. Mount 235 (Ravat 45, Rashid 6-68), Bradley &amp; Colnebridge 207-8 (RS Khan 73, Shz Khan 52): pts 11-6. *Old Town w/o v Cullingworth: pts 12-0.